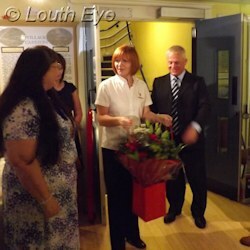 Elaine Nutbrown receives flowers as Deputy Mayor Sue Locking looks on. 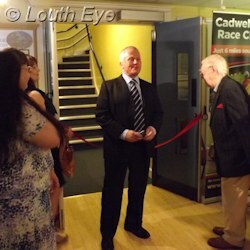 Neil Tuxworth opened an exhibition at Louth Museum on Wednesday 16th of July to celebrate 80 years of racing at Cadwell Park. Mr Tuxworth is the head of Honda Racing in the UK. He is an experience racer who has won three British Superbike titles and ten other British titles. The opening ceremony was attended by the Deputy Mayor, Sue Locking, and local historian David Robinson made a short speech to introduce the new exhibition and explain its significance. Elaine Nutbrown, an employee at Cadwell Park for over three years, was instrumental in making this exhibition happen. Angela Barker, a museum volunteer who also works at Cadwell, was also involved in getting the project off the ground. The exhibition features artwork, clothing, posters and other racing paraphernalia from Cadwell. It tells the story of the park's 80-year history as a race track. Cadwell was opened in 1931, but it didn't start hosting road races until 1934. One of the star attractions is the 350cc motorbike ridden by Mike Hailwood in 1966, the Honda RC137. 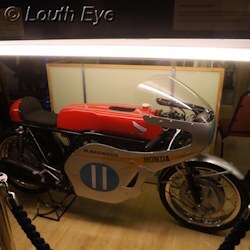 Hailwood won the 350cc World Championship on this machine, winning every race in the championship bar the Isle of Man TT to take home the title. It's a unique motorbike. It's fascinating to track how racing at Cadwell has evolved. The displays bring up some surprising facts which illustrate how attitudes to safety have changed over the years. My favourite aspect, however, was the images of old racing cars and other vehicles. There's just something viscerally exciting about the thought of tearing around a track in a primitive contraption built before anyone introduced modern technology and standards of safety. The exhibition lasts until Saturday the 6th of September. 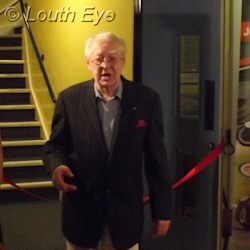 A gallery of images from the fourth annual Bike Night organised by Louth Lions.